The baby boom continues, my friends, which means I'm always brainstorming new and creative ways to welcome these little lives into the world. 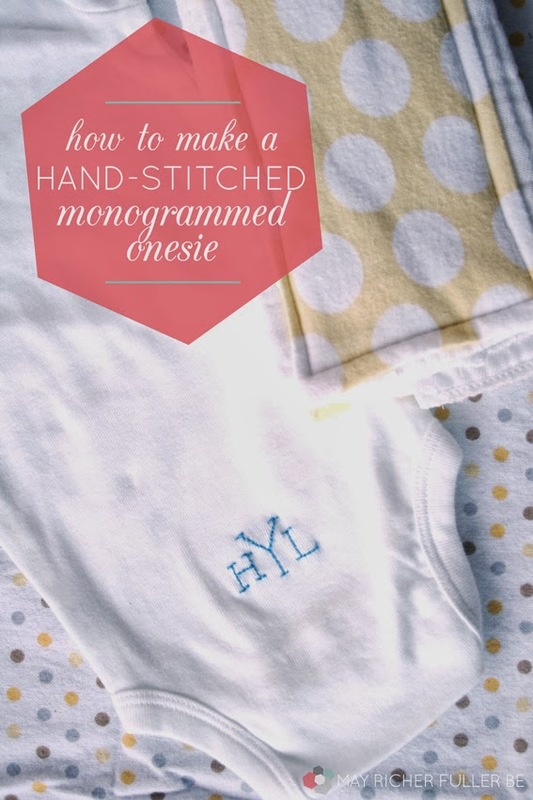 It's been nine months or so since I showed y'all how to applique onesies and make cute burp cloths, and today I've got another fun onesie tutorial to share! This time, I decided to hand-stitch a little monogram onto the backside - yep, literally on the bum. 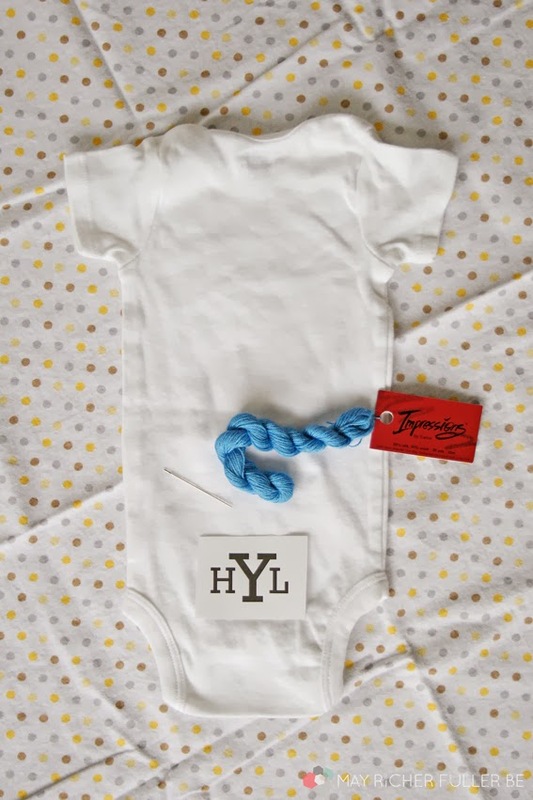 I thought it would just be so stinkin' cute to personalize that area and keep the rest of the onesie plain jane so the little one can wear it with any outfit ('cause you know they think about that sort of thing, right?). 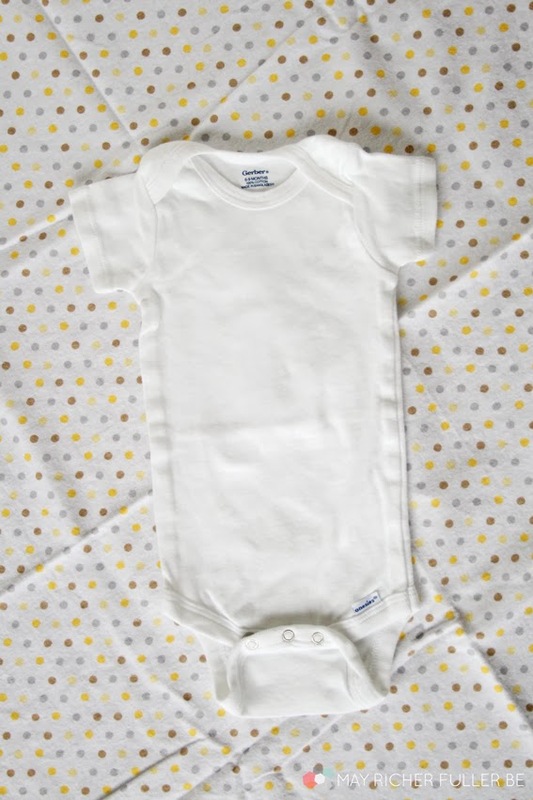 And bonus, the threads on the backside will sit against the diaper and not rub against any skin :). Let's call this the lazy gal's version of monogramming, ok? You'll see why in a minute :). 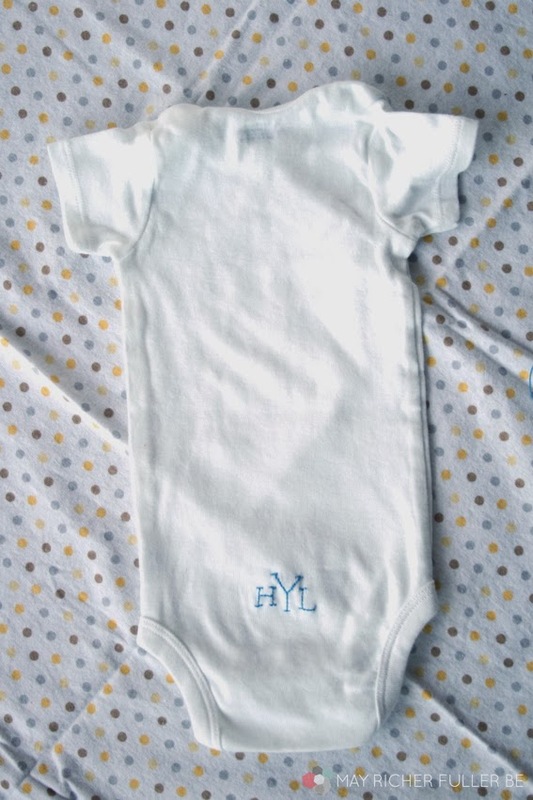 I keep a stash of white onesies around for baby gifts like this, so I grabbed one out of there and made sure it washed already so it didn't shrink later and make the monogram all wonky. I flipped it over and eyeballed where I wanted to put the monogram. 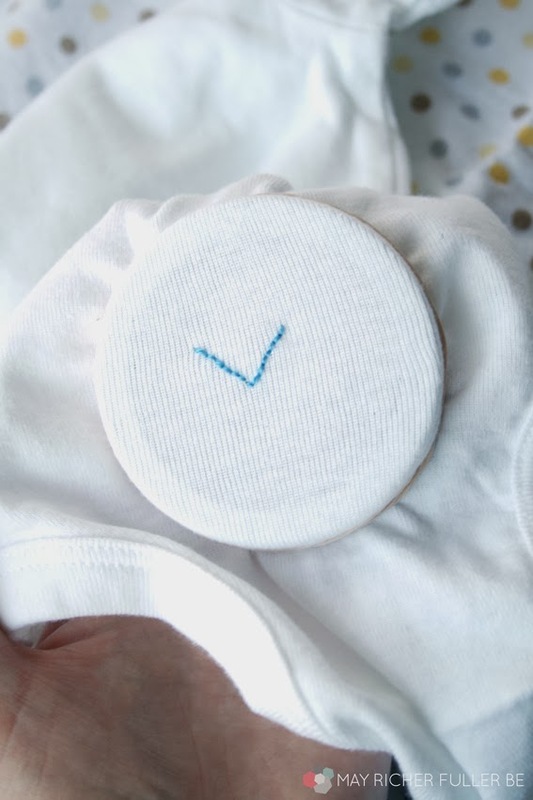 I'll be sending this to a baby boy, so I printed out the letters of his monogram in a size that would fit the area (I used Illustrator, but you can do this in Word too) and chose some blue embroidery thread to stitch it with. 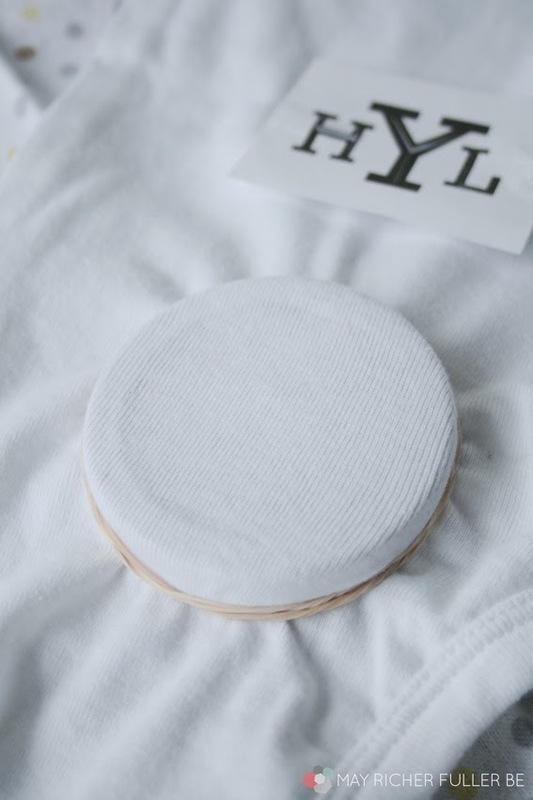 Then came the tricky part - I had to stabilize the fabric so I'd be able to stitch the monogram without it stretching in weird ways, but I didn't have an embroidery hoop on hand. Yikes! 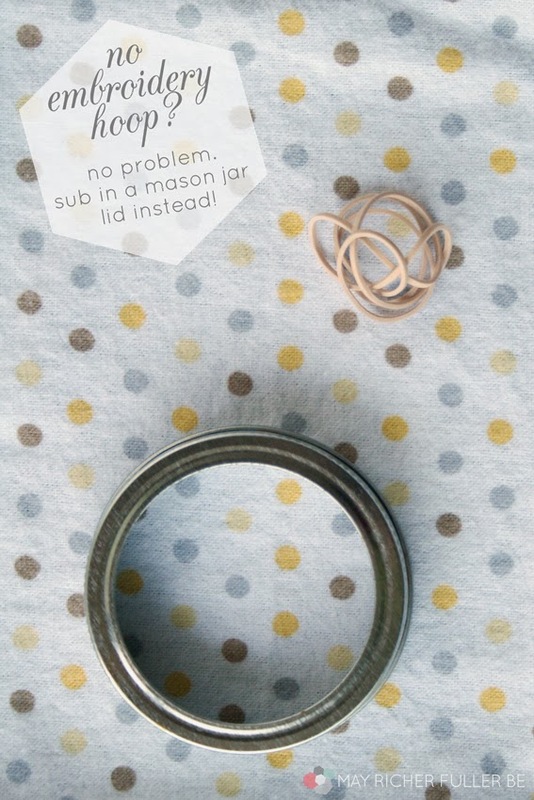 Thanks to Google, I found a perfect substitute that didn't involve me going out to the store: a mason jar lid and some rubber bands! It worked perfectly. I just slipped it under the backside of the onesie in the area I wanted to stitch on, and secured it to the fabric with rubber bands. Then I used the printout monogram as a guide to stitching the the letters by hand. 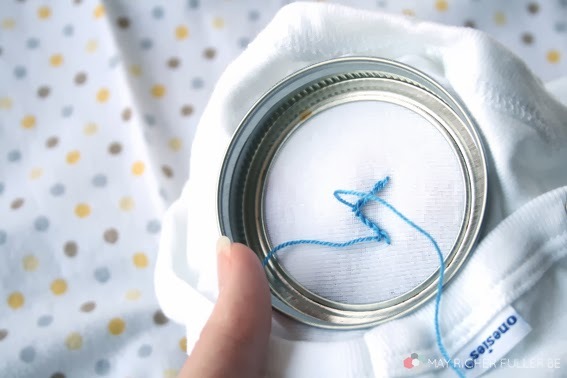 If you have a washable fabric marker on hand, you can trace the letters first and then stitch, but I didn't have one (lazy gal's version, remember?) so I just did it freehand. All done! What a cute little monogrammed bum! Since it's hand-stitched, it's not perfect, but I actually love that it looks hand-sewn. What do you think? 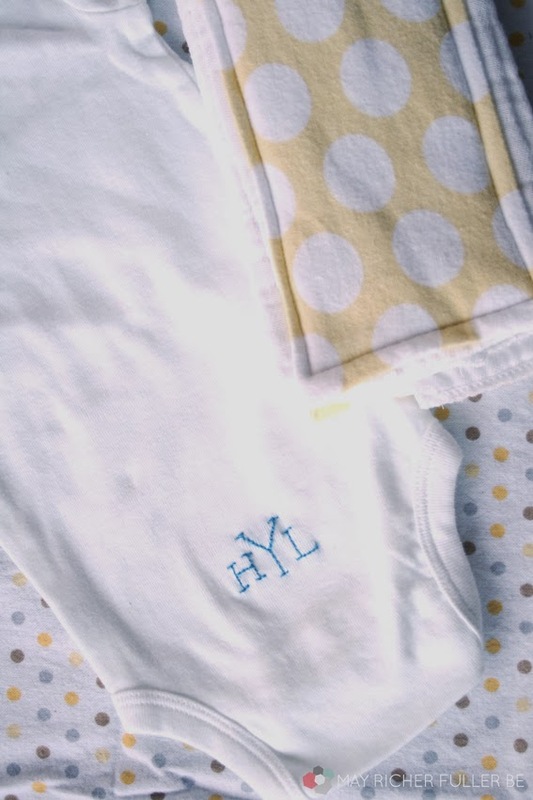 It would make a perfect gift paired with one (or a few) of these customized burp cloths, yes? I made the yellow and white polka dot one below using that method from that post. Now it's time to pop this little set into the mail to its new owner! If you're reading this, Laura, sorry I'm spoiling your surprise if you hadn't guessed it was for your little man! 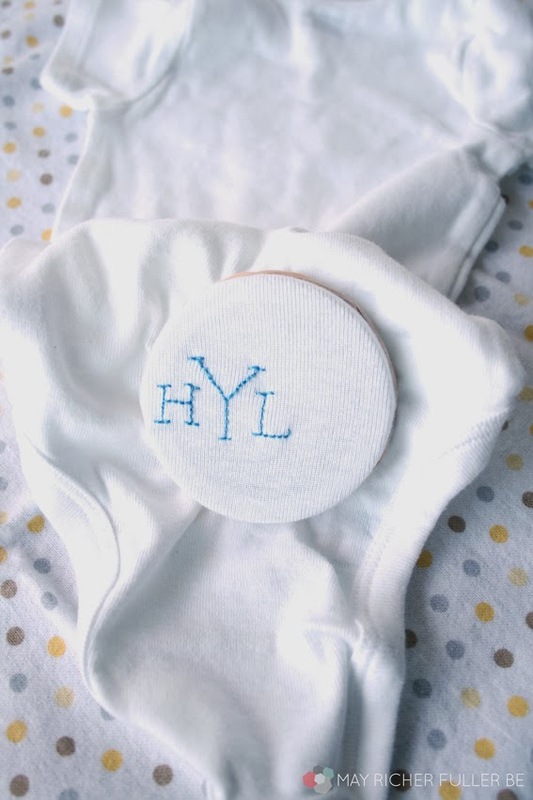 Do y'all have any favorite hand made baby gifts that you've received or given? Or, in case you're not into making gifts, but would rather buy something, you might want to check out my line of modern patterned onesies right over here! I never knew that it depended on the number of stitches one got. I just assumed that it was so much per image that was placed on the garment. Guess you learn something new each day. A very beautiful and attractive embroidery designs which display the pure beauty of embroidery digitizing.